The Mid-Coast Trolley will extend Blue Line Trolley service from Santa Fe Depot in Downtown San Diego to the University City community, serving major activity centers such as Old Town, UC San Diego, and Westfield UTC. Construction began in fall 2016 and service isÂ anticipated to begin in 2021. Visit KeepSanDiegoMoving.com/MidCoastNoticesÂ for construction information. For project news and updates, follow Mid-Coast Trolley on Twitter and like Mid-Coast Trolley on Facebook. Freeways and arterials in the Mid-Coast Corridor are generally congested and traffic congestion is projected to increase more as the region grows. The population along the corridor is predicted to increase 19 percent by the year 2030, while employment is predicted to increase 12 percent. View a â€œflyoverâ€� of the Mid-Coast Trolley route. The Mid-Coast Trolley will expand transportation capacity in the corridor to accommodate existing and future travel demand, particularly for peak-period commute trips. The project will provide an effective alternative to congested freeways and roadways for travelers and will result in fewer vehicle miles being traveled. The University City area has developed as a major employment and high density residential area, similar to Downtown San Diego. Although University City is considered San Diegoâ€™s second downtown and UCSD is one of the regionâ€™s largest trip generators, neither is directly served by regional transit. 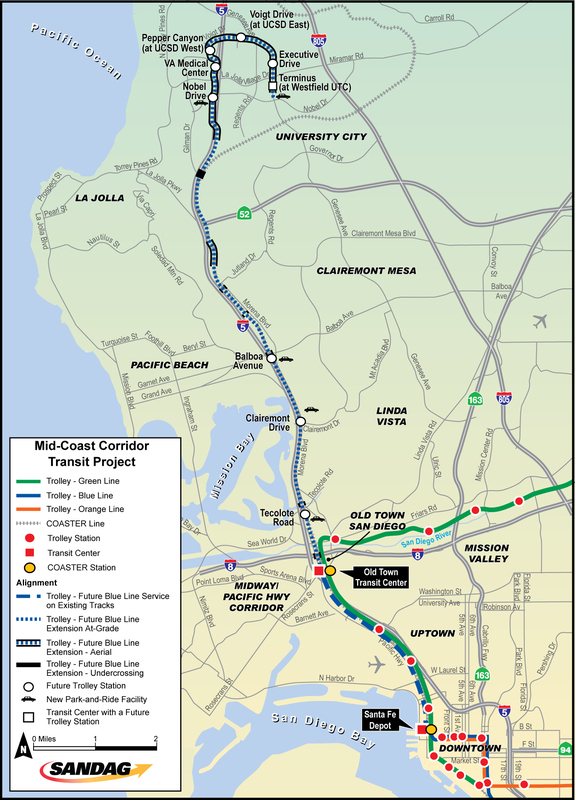 The Mid-Coast Trolley extension will provide efficient transit connections to University City and UCSD, as well as frequent and reliable Trolley service throughout the corridor. Transportation models indicate that the new trolley service will attract 20,000 new transit riders a day to the system. SANDAG has worked with the community to refine and develop designs for each station. View presentations made to corridor planning groups highlighting the design features of stations in the University Community, Pacific Beach, Clairemont, and Linda Vista. Nine new stations will be constructed at Tecolote Road, Clairemont Drive, Balboa Avenue, Nobel Drive, VA Medical Center, Pepper Canyon (serving UCSD west campus), Voigt Drive (serving UCSD east campus), Executive Drive, and the Terminus Station at the Westfield UTC Transit Center. View station simulations. TheÂ project will connect corridor residents with other Trolley lines serving Mission Valley, East County, and South County. As an extension of the existing Metropolitan Transit System Trolley Blue Line, it will offer a one-seat (no transfer) ride from the international border and communities south of Downtown San Diego all the way to University City. This new service will enhance direct public access to other regional activity centers and improve travel options to employment, education, medical, and retail centers for corridor residents, commuters, and visitors. In fall 2014, the Mid-Coast Trolley received its final environmental clearance from the SANDAG Board of Directors and the Federal Transit Administration (FTA). In September 2016, the FTA signed a Full Funding Grant Agreement with SANDAG to provide the 50 percent federal funding match needed to begin construction in fall 2016. The other half of the funding will be provided by TransNet, the San Diego regionâ€™s voter-approved half-cent sales tax for transportation improvements. Pre-construction activities â€“ consisting of the relocation of underground utilities out of the way of the project alignment â€“ began in early 2016. Primary construction activitiesÂ began in fall 2016. 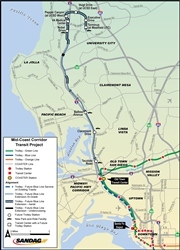 In May 2014, the SANDAG Board of Directors selected Mid Coast Transit Constructors, a joint venture firm of Stacy & Witbeck, Inc., Skanska USA, and Herzog Contracting Corporation, to serve as the construction manager/general contractor for the project. Companies interested in contracting opportunities on the Mid-Coast Trolley project can find more information here. Small contractors and disadvantaged business enterprises interesting in working on SANDAG projects also can find more information here.